School is out — which means kids will be looking for things to do. A great thing about living in West Sound is that there are a number of ways to enjoy summer vacation close to home, and most of them are free. So, as you make your plans for this summer, use this list to find some fun excursions you and your kids can enjoy together, right here in West Sound. 1. Enjoy one of our state parks. State parks offer hiking, camping, boating, swimming and picnicking, along with other fun on sand and pebble beaches. State parks in West Sound include Belfair, Blake Island, Illahee, Jarrell Cove, Joemma Beach, Kopachuck, Manchester, Penrose Point, Scenic Beach and Twanoh. A Discover Pass, sold at park entrances, is required for admission. 2. 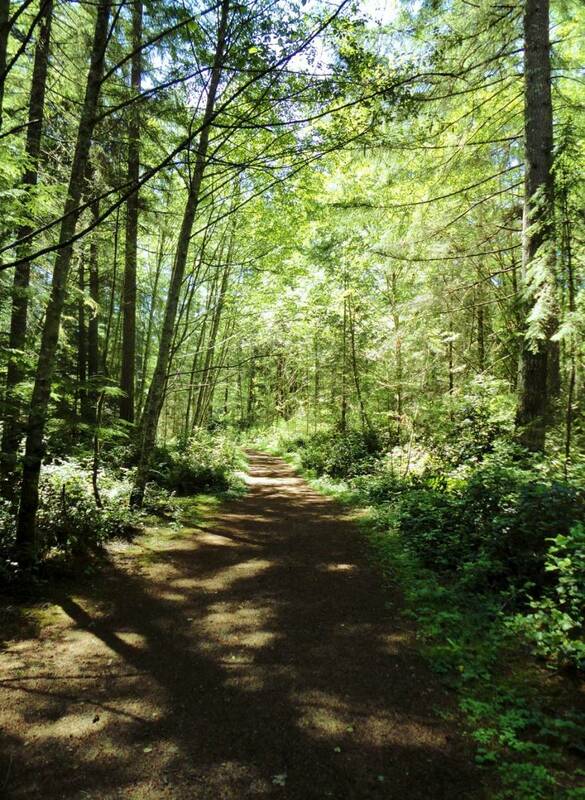 Spend a day in Hansville’s recreation area. 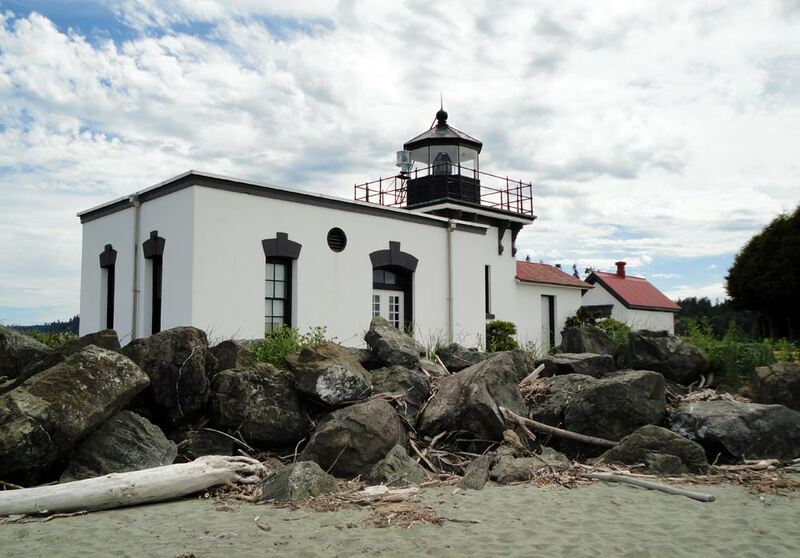 Hansville is home to the Point No Point lighthouse — the oldest lighthouse in Puget Sound. Tour the lighthouse (only open for tours on weekends), fly kites, play in the sand on the expansive Point No Point beach. Keep an eye out for private boats and shipping vessels in Puget Sound. 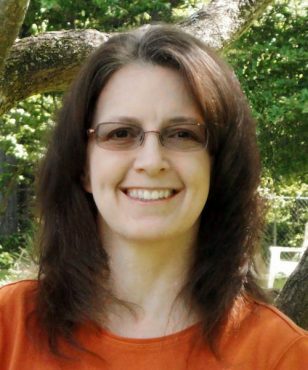 Nearby recreation includes the Hansville Greenway Trail and the 101-acre Foulweather Bluff Nature Preserve. 3. Walk Silverdale’s Clear Creek Trail. The Clear Creek Trail includes 1.4 miles of a level, partially paved trail through wetlands and 5 miles that are unpaved along Clear Creek. The entire trail system is open to pedestrians and bikes. 4. Walk or bike the Cushman Powerline Trail in Gig Harbor. This amazing trail consists of 6 paved miles divided into several segments, each having its own trailhead. Some sections have gorgeous views of the surrounding scenery. The trail is hilly and has minimal shade in some sections, so prepare accordingly. 5. Go for a hike in the forest. Most of the trails in West Sound range from easy to moderate. My favorite forest hikes are the 2.5-mile loop trail in Belfair’s Twanoh State Park, the network of trails in Gig Harbor’s McCormick Forest Park and the Big Pond Trail in Port Orchard’s McCormick Woods (trailhead at Deer Park). 6. Ride bicycles or horses on a forest trail. 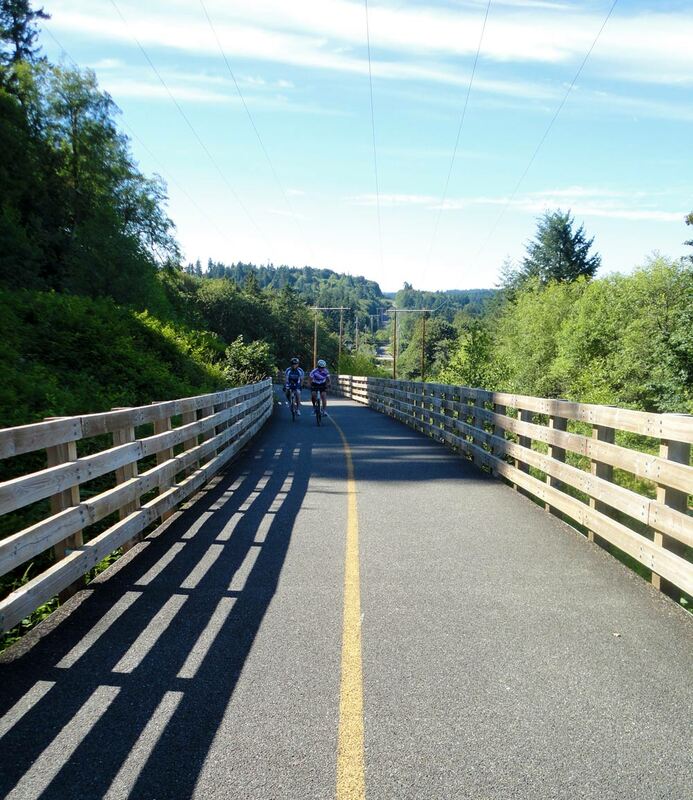 The Hansville Greenway Trail in Hansville, Banner Forest Heritage Park in Port Orchard, Newberry Hill Heritage Park in Silverdale, and the 360 Trails in Purdy (named for their location on 360 acres) have both mountain biking and equestrian trails. 7. Hike the trails in the Guillamot Cove Nature Reserve near Seabeck. 8. Spend a day at the Belfair’s Theler Wetlands Nature Preserve. The Theler Wetlands on Hood Canal has several short trails and a boardwalk. The preserve’s Wetlands Project Center provides hands-on exhibits to teach children about the wetlands ecosystem. Free admission. 9. Walk the beautiful, sandy beach at Anderson Point County Park in Olalla. To reach this peaceful beach on Puget Sound, you have to walk approximately one mile down a gravelly service road. The walk is worth the effort to reach one of the nicest beaches I’ve been to in West Sound. 10. For more of a challenge, hike up Green Mountain (west of Bremerton). The Gold Creek Trail climbs steadily up Green Mountain, through a forest and meadow, ending with a panoramic view. This trail is most suitable for kids ages 10 and up. 11. Swim at a freshwater lake or saltwater beach. Three popular swimming holes in West Sound include Fay Bainbridge Park on Bainbridge Island, Island Lake Park in Poulsbo, Twanoh State Park in Belfair and Scenic Beach State Park in Seabeck. Kitsap County is along the Pacific Flyway and has multiple places that are ideal for birdwatching. Sometimes, you can even spot eagles and herons along the shores of Puget Sound. See the Great Washington State Birding Trail website at wa.audubon.org for popular birdwatching locations. 13. Take your kids fishing. West Sound is home to a number of freshwater lakes and saltwater fishing piers. Wildcat Lake County Park in Bremerton is a popular freshwater fishing hole. Most waterfront towns have at least one public fishing pier. Fishing permits are not required for kids under the age of 15. Visit wdfw.wa.gov/fishing/piers and fishhunt.dfw.wa.gov for fishing regulations and locations. 14. Kayak in one of Puget Sound’s bays. The Olympic Outdoor Center provides kayak rentals at a number of beaches in West Sound, including Port Gamble, Poulsbo and Silverdale. For information on kayak rentals, visit olympicoutdoorcenter.com and the South Sound Area Kayakers map of launch sites (if you have your own kayaks). You can camp in a forest setting near the beach or a lake at nearly any of West Sound’s campgrounds. Among the most popular are Manchester State Park, Scenic Beach State Park and Belfair State Park. Visit parks.state.wa.us for other locations and more information. A Discover Pass is required at state parks. 16. Look for sea life on a beach at low tide. Penrose Point State Park near Gig Harbor and Manchester State Park outside of Port Orchard are rocky beaches with mussels and barnacles, sea stars, crabs and other sea life visible at low tide. Wear shoes that can handle walking on rocks. Visit saltwatertides.com for tide tables and parks.state.wa.us for state park information. A Discovery Pass is required for admission. 17. Observe sea life up-close at the SEA Discovery Center in Poulsbo. Kids love the tide pool touch tank and other hands-on exploration of marine life offered at the SEA Discovery Center. Free admission, but donations are accepted. 18. Learn about Puget Sound’s sea life through a Harbor WildWatch program. Harbor WildWatch is an organization that allows kids to learn about life in Puget Sound through interactive, hands-on educational activities at local beaches such as touch-tanks and interpretive walks. Most of the programs are free. See harborwildwatch.org for their program schedule and more information. 19. Learn about gardening from a Master Gardener. The Anna Smith Children’s Park and Blueberry Park in Bremerton, Sehmel Homestead Park in Gig Harbor and Raab Park Community Garden in Poulsbo have demonstration gardens where Master Gardeners teach garden-related classes weekly throughout summer. The Anna Smith Children’s Park also has a small butterfly house. See kitsap.wsu.edu and annasmithchildrenspark.blogspot.com for summer schedules. 20. Visit West Sound’s public gardens. West Sound is home to two public gardens, both of which are located in a woodland setting and have features that are fun for kids to explore. The Bloedel Reserve on Bainbridge Island has a Japanese Garden, bird marsh and birch grove. There is also a boardwalk and trestle bridge. Heronswood in Kingston is a newly-opened public garden with themed garden rooms, topiary and outdoor sculptures. Please visit the listed websites for information on wheelchair accessibility, restrooms, restrictions, open times, closures, fees and driving directions.